Last week Charlotte made burgers and chips for dinner, and Phyllis chucked a bag from Waitrose onto the table. 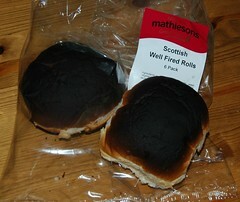 It contained six completely black rolls, as well as a sticker saying “reduced”. I obviously thought the price had been reduced because somebody had forgotten them in the oven for two hours, so I commented to Phyllis that I found it strange that the shop hadn’t binned them instead of trying to sell them at a reduced price, given that nobody in their mind would go near badly burned food, which is likely to be carcinogenic. She looked at me like I had just landed from Mars and pointed out the the bag was labelled “Scottish Well-Fired Rolls” and that Scots have eaten this type of rolls for ages. I’m quite relieved I didn’t encounter them earlier! They’re surely an even more appalling Scottish delicacy than deep-friend Mars bars and deep-fried pizzas (which actually taste very nice). Well-fired rolls for the win! Om nom nom with wee black bits in your teeth! I’m not saying Danish is the culinary leader of the world! Og tænk sig, så har vi i så mange år fået at vide, at man skulle skrabe det brændte af, og i stedet kunne vi have eksporterer alle de boller til Skotland og tjent styrtende på det.